Some jobs you really need someone there to hold a flashlight for you. However, there isn’t always someone around to help out with odd jobs like that. That’s where these bracelets come in. Yes they do look a bit like something that belongs at a party or something along those lines. However, they also would be great to illuminate whatever it is you’re working on. Which would be far more convenient than trying to hold a miniature flashlight in your teeth. These are sold in sets of two, so you could wear one on each wrist or two on one wrist for extra lighting. 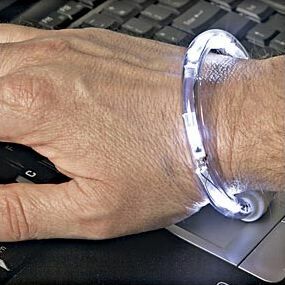 Each bracelet features four LED lights, which should put off a nice strong glow. Each bracelet measures 3 and 1/4” in diameter. I doubt any guy could get away with wearing these without a little friendly teasing from friends. Yet, if it’s effective then it’s probably well worth it. You can purchase these in sets of two on Computer Gear for $19.99. Would be cool to wear but I don’t see how it would be compared to a flash light. It would just be ambient.